Line cookie sheet with baking parchment paper. Roll puff pastry out into a 10" square and put on cookie sheet. Add 1 Tbsp sugar, 1/3 cup brown sugar, lemon juice, flour, chopped pecans and cinnamon to the apple slices and mix gently. Pile the apple filling in the center of the puff pastry leaving 2" around the edge free. 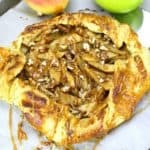 Pull up the outside edge of the pastry, over the outer edge of the apples, leaving the center part uncovered, folding the pastry as needed and pinching together gatherings of pastry. Beat the egg. Brush it on the pastry. Sprinkle with 1 tsp sugar. Bake 35-40 minutes, until the apples are soft and the pastry is golden. Serve warm or cold. Serves 4-6. Add drizzles of caramel over the top, a scoop of ice cream, and more chopped pecans to your hearts desire.